SPRINGFIELD, Mass. 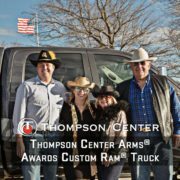 – Thompson/Center announced today that the winner of Thompson/Center Arms “Follow Your Compass Dream Truck Giveaway” has been selected. The lucky winner is Jim H. and his wife Judy from Iowa. 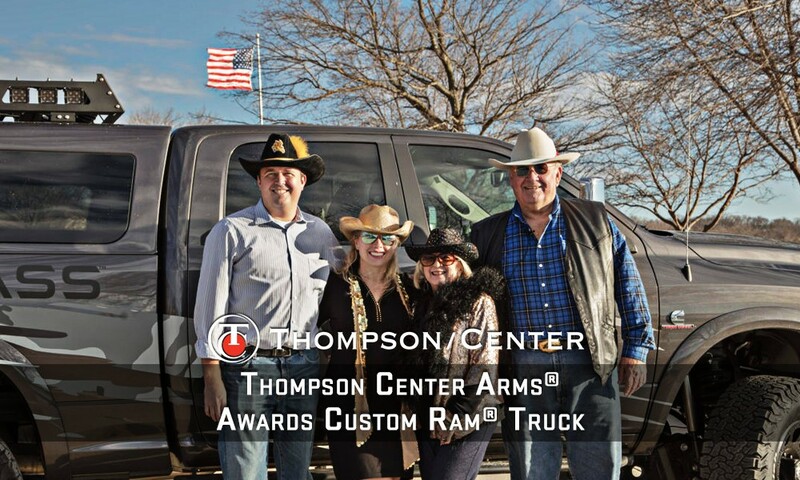 Jim and Judy are the proud new owners of this one-of-a-kind custom T/C-branded RAM truck. Jim is a long-time hunter and he said, “My family and I were going through a rough period and this truck really lifted us up. We can’t even tell you how excited we are. We are ecstatic and just thrilled to pieces, our old truck is on its last leg so this is just perfect.”Danielle Sanville, Brand Manager for Thompson/Center Arms. “Thompson/Center has many loyal fans just like Jim. When we announced the sweepstakes our fans went crazy. Everywhere we took the truck, it drew huge crowds of people. We at Thompson Center are very proud that our products are designed and made in the USA. T/C is committed to providing hard working people with good, quality products that will last a lifetime. T/C built a reputation for being America’s Master Gun maker. Our goal with this sweepstakes was to introduce new consumers to the value and reputation that Thompson Center is known for. We are working hard to continue this legacy. Danielle Sanville said, “I was lucky enough to personally drive the truck to Jim and his wonderful family. I was so happy to get to know Jim during our afternoon together. I know Jim will have an opportunity to make many memories every time he heads into the field with his Thompson/Center Dodge RAM truck and his T/C Compass .300 Win Mag rifle. 2016 RAM 2500 Crew Cab 4×4 that was upgraded with a 6.7 L Cummins Turbo Diesel Engine, 35-inch BF Goodrich All-Terrain T/A KO2 tires, a Fabtech 2.5-inch Suspension system, a custom front and rear bumper with LED light kit, Superwinch TigerShark 11,500 lb. winch, and a 2-drawer TruckVault. The T/C Compass rifle blends American-made craftsmanship and value into a professional grade, bolt-action rifle. The T/C Compass rifle is available in 10 of the most popular calibers from .22-50 to .300 Win Mag and features an adjustable trigger, pillar bedded action, and a free-floated 5R rifled barrel with guaranteed MOA accuracy. Other features include an easy-to-accessorize threaded muzzle, a lightweight textured synthetic stock with raised cheek piece, three-position safety, and 60-degree bolt lift for increased scope clearance. Additionally, the T/C Compass rifle ships with a flush-fit rotary magazine and is equipped with Weaver-style bases for easy scope mounting. With an MSRP of $399, The T/C Compass rifle includes a limited lifetime warranty. For more information, go to www.tcarms.com, or your local T/C Arms authorized retailer.